I know of a few people that have bought multiple items off Craigslist and exclaim about the great deals they have got. Well, I bought my first item off Craigslist and I think I got a good deal. I have been carrying my sewing machine from the back of the house to the dining room table for years and now I have carried it a few times to and from the car when I went to sewing classes. 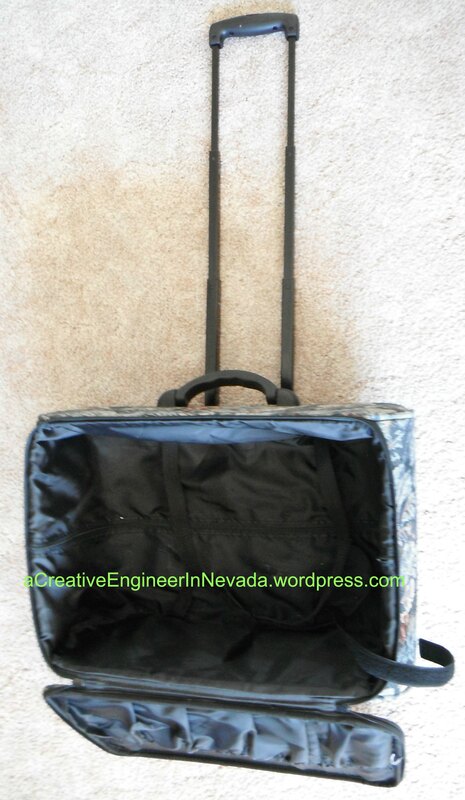 I was about ready to buy a rolling case, but when I priced them in JoAnn’s Fabric they were about $50.00 on sale – more than I wanted to pay. So, I figured it would have to wait until I could get it for a birthday present. Well, I scanned our local Craigslist (which covers many towns and probably hundreds of miles) and found someone with a rolling sewing machine case for $20.00 and it listed my town – even better. I called and she still had it so I went and picked it up. She was given a sewing machine and the case 10 years ago and never used them so the case is like brand new. I put my machine, etc in it and it is so much easier to transport inside the house and to/from the car. So, if you are looking for something and don’t mind if it is used you might find a deal on Craigslist (or a similar site).